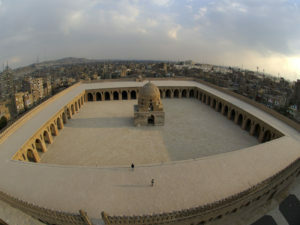 It is the third mosque built in Islamic Egypt and lies in the district of Sayeda Zeinab. It was completed in 878 AD by Al Amir Ahmed Ibn Tulun, founder of the Tulunid dynasty. It is one of the largest mosques as its area amounts to 162 x 162 meters and the dimensions of its central open space “sahn” 92 x 91 meters surrounded by an open corridor. The mosque is known for its rich varied collection of gypsum ornamentation and engravings. Its minaret is unique in Egypt as it has an outside staircase.